Morbid or merely macabre? Gruesome dead animals, or respectfully crafted memorials? 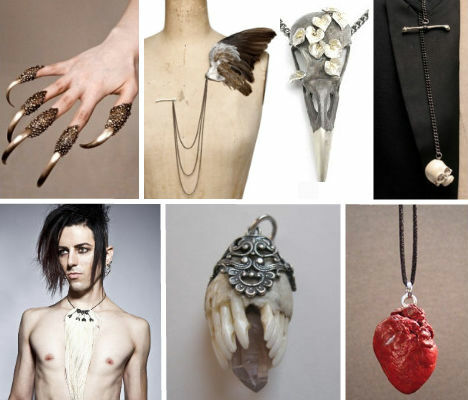 The incredible (and undeniably creepy) creations of these 12 jewelry artists provoke strong reactions, whether you think they’re meaningful wearable works of art or just plain bizarre. 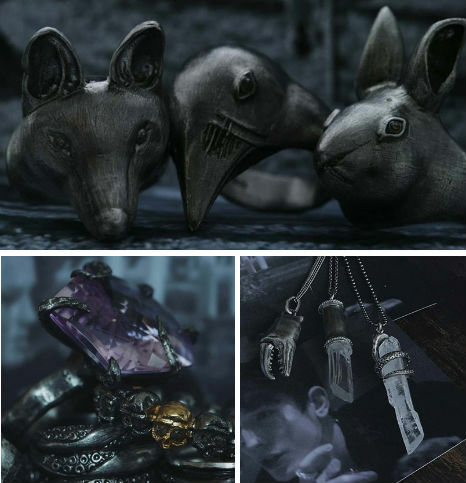 Preserved raccoon heart pendants, talon rings and severed tentacles in tiny glass bottles definitely aren’t for the faint of heart. “By creating an aggressive dichotomy between subtle, elegant forms and vicious primal instinct I am able to transform the frame of reference the wearer is displayed in,” says Brooklyn-based metalsmith Danielle Nicole Hills of her highly unusual designs. 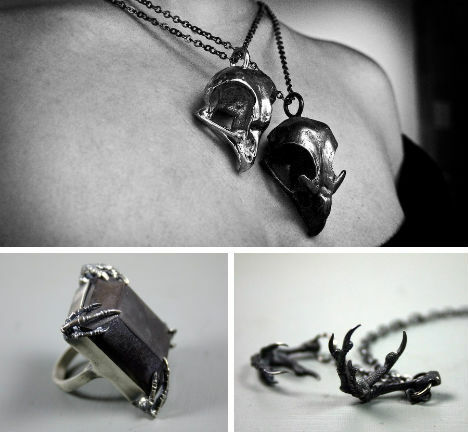 Hills’ menacing ‘Predator Rings’ would certainly make the daintiest of women look like a terrifying huntress, and her bladed hair comb – while only subtly scary – is modeled after an executioner’s blade. Medical sample rings, a ‘camouflage’ chain headdress made from cast helicopter seeds and a surgical mask bearing false human teeth round out an attention-grabbing collection. What to give the person who has everything? How about a preserved raccoon heart on a silk cord? Or perhaps some mummified kitten paw earrings would be more to your loved one’s taste. While taxidermy brings to mind cluttered unsanitary workshops filled with dead animals of spurious origin, Custom Creature Taxidermy artist Sarina Brewer is in no way typical. 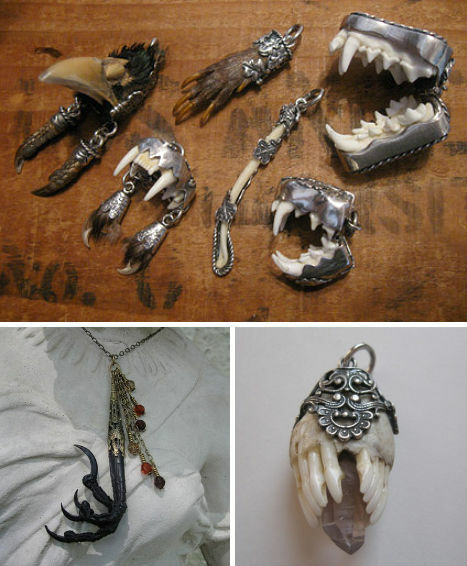 Brewer, who got into taxidermy when she began incorporating animal remains into her sculpture and paintings, is an avid naturalist who uses only recycled animal components and adheres to a strict “waste not, want not” policy – hence the strange offerings like ‘mystery mummified paw pendants’ and ‘coiled rat tail necklaces’ in her jewelry department. 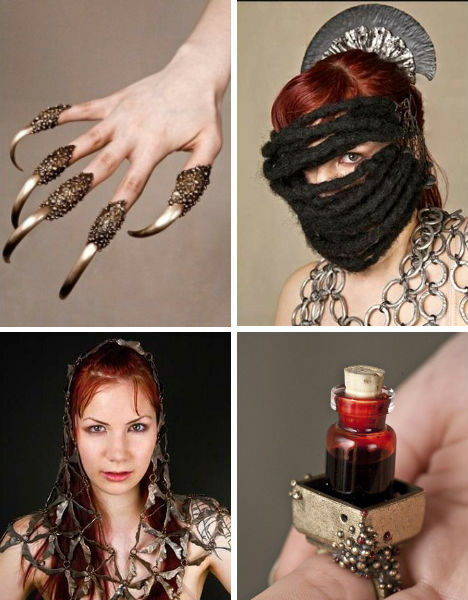 Die-hard fans of the HBO series True Blood might recognize Pamela Love’s talon jewelry, but Love’s line is much more than these admittedly awesome creepy claws. 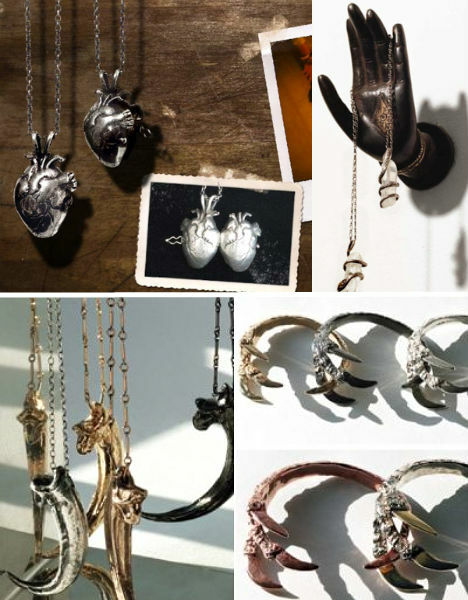 Human heart-shaped lockets, serpents wrapped around crystals and swords dangling from rosary-like necklaces are just a few of the pieces you’ll find in Love’s collection. 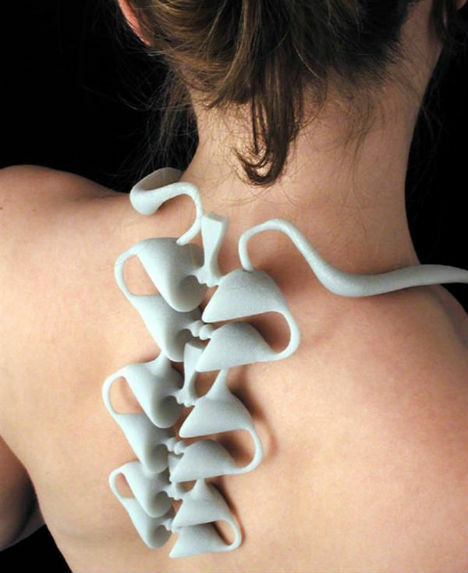 Startling, perhaps, to see the spine outside the body like this. But Temple University student Molly Epstein’s ‘Vertebrae Necklace’ – made from glass-filled nylon for a senior project – has a macabre elegance to it. If subtle creepiness is more your style, Bjorg’s 2010 collection is dark but refined. Inspired by the work of Charles Darwin, the Norwegian jewelry label offers up crab claws, snake skeletons and octopus tentacles in gleaming gold and understated oxidized silver, often adjacent to big hunks of raw, unpolished gemstones. 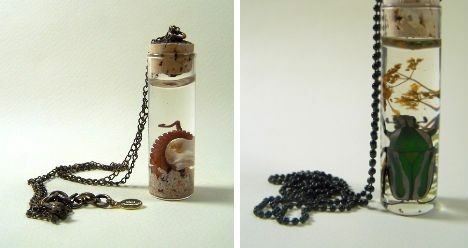 It’s just what you’ve always wanted: a prairie dog foot, preserved in a vial you can wear around your neck. 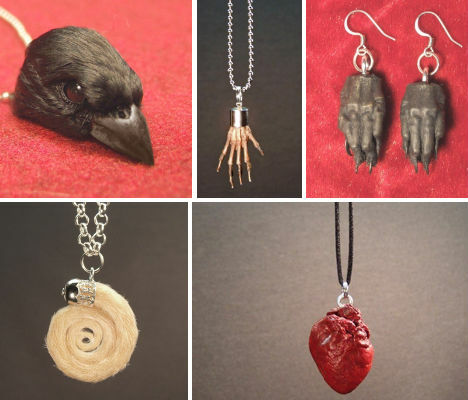 Silent Cheesecake Designs makes that and more, offering a plethora of affordably priced, witchy accessories including bones, tentacles and insects in a well-stocked Etsy shop. “The Black Forest Relic Collection is a kind of Memento Mori to remind people about our current deforestation crisis: the tragic loss of the world’s sacred forest sanctuaries and the plants and animals it protects,” says Lavona King, proprietress of Beloved & Co. King collects and sells 19th century “hunting relics”, worn to adorn traditional folk costumes and thought to bring good luck while hunting – including the working jaws of small critters, and detached bird beaks. Bats are some of the creepiest creatures around (or most adorable, depending on your outlook) – and their skulls are just as fascinating as the animals themselves. 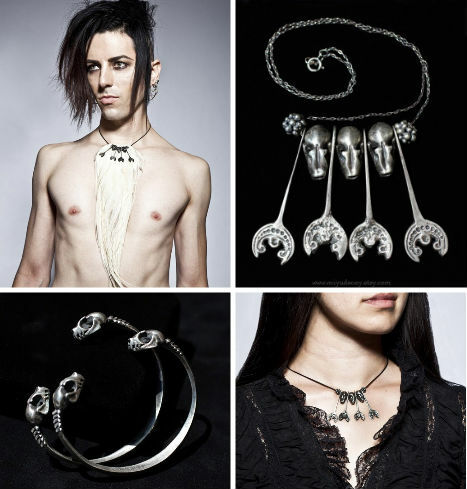 Designer Stephanie Inagaki of Miyu Decay pairs sterling silver skulls with intricate pendants, leather cord and feathers to create one-of-a-kind jewelry that guarantees a second look. Sparrow claws grip a matte rectangle of oxidized sterling silver. 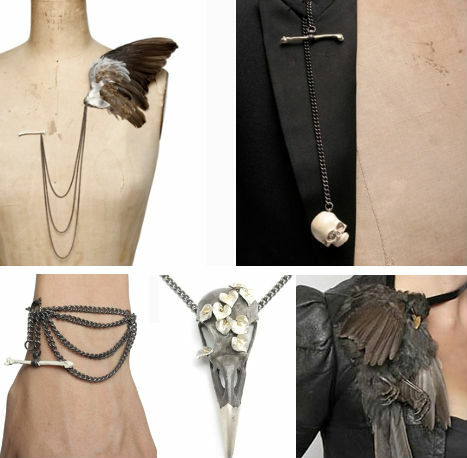 Metallic bird skulls with pointy beaks perched on the third finger of a mannequin’s hand. Blood Milk’s cohesive, muted line is undeniably dark – and it’s a rare person who actually wants to wear a bird claw around her neck – but it veers away from mere shock-value horror-jewelry into a realm of understated melancholia. Our teeth are precious while they’re in our mouths, but once they’re out, they’re tossed aside – unless Polly Van der Glas has anything to do with it. 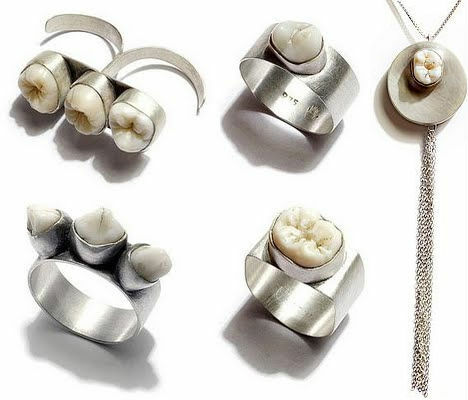 Van der Glas designs sterling silver jewelry featuring real human teeth and human hair, including incisor rings that could really do some damage in a punch. “Teeth are particularly difficult to come by, so any donations are gratefully accepted,” she writes on her website.